Ok, it was some slacking and playing games, as I spent all of last weekend in Chicago (more on that later). But I have some solid progress to report, the Fire Giant is finished, along with the Sea Serpent. Both turned out really awesome and the client is really happy with them too. I am now deep into progress on the Troll, which just needs a bit more work and he'll be finished too. I am extremely pleased with the gems on his belt. I think they are probably the best gems I've ever painted. They've gotten a lot of compliments, and the gold around them seems to really make them pop a bit more. 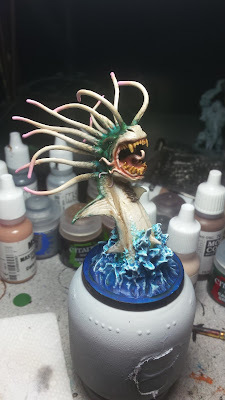 With the Fire Giant done I moved on to the mini I was most looking forward to painting, the Sea Serpent! 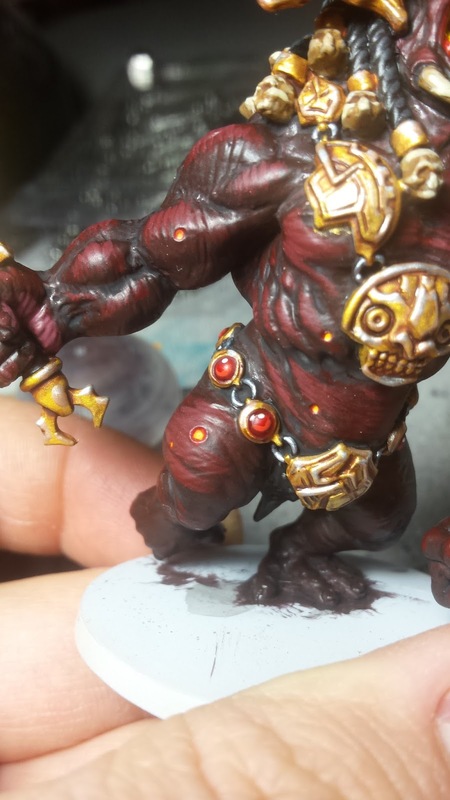 Painting beast's skin always seems intimidating to me. It's because in real life, animal skin is rarely ever one color. There's color patterns, mottling, and other natural camouflage that animals use in real life for survival. That said, I decided to paint the Sea Serpent in a blue-green with mottled brown spots. These spots were made using a natural sponge, like how I did the skin on C'thulhu. I used two tones of brown to give it a bit more color variation and applied it thinned more than usual, so it would blend with the green skin more. The underbelly was painted using Rakarth Flesh, which was then highlighted with Fair Skin gradually mixed in and drybrushed in successive layers. The tentacles were painted using the same mixes, but instead of drybrushing, painted them on normally, and used dots of random shapes and sizes near the bottom to act as mottling and make the transition from green/brown to flesh tones. When the flesh tones were done, I took some Rosy Skin and began glazing the tips of each tentacle with it. Each new layer had pink added to it and gradually got pinker towards the tips. These gave the tentacle more character and dimension. The water was an interesting challenge. I've never painted splashing water before, other than an old water elemental I had painted back in the mid-90's. I started with a base coat of Reaper Master Series HD Arthurian Blue and washed it with Biel-Tan Green wash from Citadel. After the base coat, I added some Sotek Green to the Arthurian Blue to give it a bit of a turquoise tint and painted it on the top 2/3s of the splash. Then I started mixing in Atlantean Aqua to brighten it up, I painted this mix on the top 1/3 and covered all of the highest points and splashes. More Atlantean Aqua was added to the mix and painted on the higher points of the water and along the tops of the ripples too. Finally I mixed in some White and painted that on the very tops and edges of the splashes and ripples. Now, I am working on the Troll. 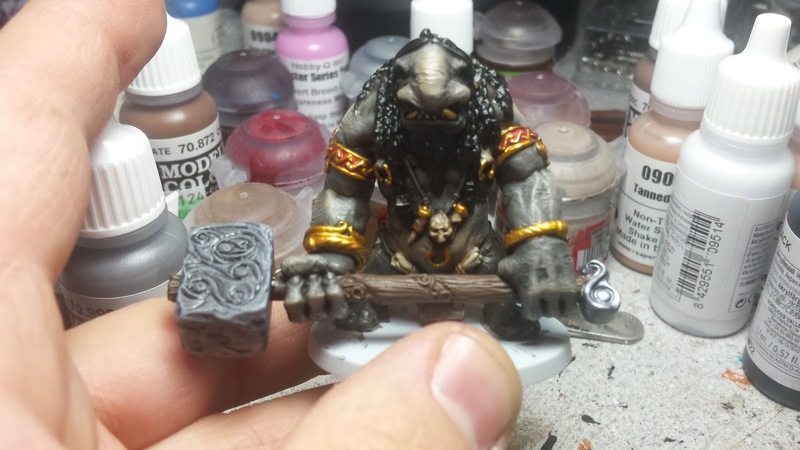 As soon as I saw him, I knew I wanted to do grey skin highlighted up to flesh tone. I started by basecoating him with Vallejo Grey Green and a wash of Nuln Oil. From there I started drybrushing him with Green Grey and then kept adding Tanned Skin to it, to add flesh tone. He's pretty close to being finished and then I can get started on the small minis, which should go much, much faster.